The Standing Stones are magical stones found in the wilderness which can give your character special abilities and powers. There are thirteen Standing Stones in total, each associated with one of Tamriel's thirteen constellations. Usually, only one stone's effects can be active at a time, although you can change which stone is active at any time by activating a different Standing Stone. However, by wearing the Aetherial CrownDG, you may be affected by two standing stones concurrently. The first three stones most players will encounter are the three Guardian Stones: the Mage Stone, the Thief Stone, and the Warrior Stone. These three stones are found together in a circle outside the starting dungeon. Selecting one of these stones allows you to effectively specialize in one group of skills. All of the other stones are located on their own. On an island in the Hjaalmarch marsh, just north of Fort Snowhawk, west-northwest of Morthal (map). In the southernmost part of the hot springs of Eastmarch, northwest of Mistwatch and east-northeast of Darkwater Crossing (map). On an island in Lake Ilinalta, directly north of Falkreath (map). East of Morthal, northeast of the Shrine of Mehrunes Dagon, about one and a half times as far as Stonehills, up on the mountain. Follow the path starting north of the Hall of the Vigilant to the Shrine and the Stone (map). East of Markarth, just north of Kolskeggr Mine (map). Southwest of Riverwood, by the roadside, one of the Guardian Stones (map). Directly east of the College of Winterhold and northeast of the Wreck of The Pride of Tel Vos, on an icy island in the Sea of Ghosts (map). South of Riften, near Nightingale Hall (map). Northwest of Solitude, near Ironback Hideout (map). About halfway between Dawnstar and Winterhold, on a high snow-covered cliff (map). You must discover one standing stone, then activate its blessing. This is most easily accomplished using one of the three Guardian Stones. You must discover all thirteen of the standing stones (see bugs). The Standing Stones are comparable to the Birthsign Stones from Oblivion. The Atronach Stone has a 50% chance of causing all Summoning spells and powers to fail. See Spell Absorption for details. 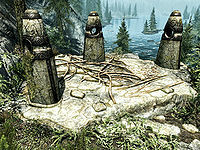 Archery is assigned to the Thief Stone, instead of the Warrior Stone. It is possible to receive the "Standing Stones" achievement by visiting any of the standing stones a total of 13 times rather than finding all 13. This may result in being stated to have visited more than 13 stones, as repeat visits are not taken into account. This page was last modified on 27 December 2018, at 08:35.